The United States District Court for the Northern District of Texas (in case citations, N.D. Tex.) is a United States district court. Its first judge, Andrew Phelps McCormick, was appointed to the court on April 10, 1879. 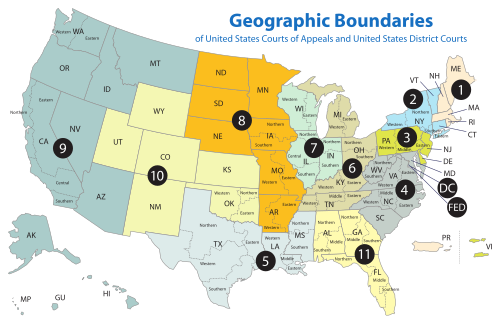 The court convenes in Dallas, Texas with divisions in Fort Worth, Amarillo, Abilene, Lubbock, San Angelo and Wichita Falls. It has jurisdiction over 100 counties in the northern and central parts of the U.S. state of Texas. The United States Attorney's Office for the Northern District of Texas represents the United States in civil and criminal litigation in the court. The current United States Attorney is Erin Nealy Cox. Appeals from this court are heard by the U.S. Court of Appeals for the Fifth Circuit, which includes Louisiana, Mississippi and Texas (except for patent claims and claims against the U.S. government under the Tucker Act, which are appealed to the Federal Circuit). The Abilene Division, covering Callahan, Eastland, Fisher, Haskell, Howard, Jones, Mitchell, Nolan, Shackelford, Stephens, Stonewall, Taylor, and Throckmorton counties. The Amarillo Division, covering Armstrong, Briscoe, Carson, Castro, Childress, Collingsworth, Dallam, Deaf Smith, Donley, Gray, Hall, Hansford, Hartley, Hemphill, Hutchinson, Lipscomb, Moore, Ochiltree, Oldham, Parmer, Potter, Randall, Roberts, Sherman, Swisher, and Wheeler counties. The Dallas Division, covering Dallas, Ellis, Hunt, Johnson, Kaufman, Navarro, and Rockwall counties. The Fort Worth Division, covering Comanche, Erath, Hood, Jack, Palo Pinto, Parker, Tarrant, and Wise counties. The Lubbock Division, covering Bailey, Borden, Cochran, Crosby, Dawson, Dickens, Floyd, Gaines, Garza, Hale, Hockley, Kent, Lamb, Lubbock, Lynn, Motley, Scurry, Terry, and Yoakum counties. The San Angelo Division, covering Brown, Coke, Coleman, Concho, Crockett, Glasscock, Irion, Menard, Mills, Reagan, Runnels, Schleicher, Sterling, Sutton, and Tom Green counties. The Wichita Falls Division, covering Archer, Baylor, Clay, Cottle, Foard, Hardeman, King, Knox, Montague, Wichita, Wilbarger, and Young counties. The first federal judge in Texas was John C. Watrous, who was appointed on May 26, 1846, and had previously served as Attorney General of the Republic of Texas. He was assigned to hold court in Galveston, at the time, the largest city in the state. As seat of the United States District Court for the District of Texas, the Galveston court had jurisdiction over the whole state. On February 21, 1857, the state was divided into two districts, Eastern and Western, with Judge Watrous continuing in the Eastern district. Judge Watrous and Judge Thomas H. DuVal, of the Western District of Texas, left the state on the secession of Texas from the Union, the only two United States Judges not to resign their posts in states that seceded. When Texas was restored to the Union, Watrous and DuVal resumed their duties and served until 1870. In 1879, Texas was further subdivided with the creation of the United States District Court for the Northern District of Texas, using territory taken from both the Eastern and Western districts. 1 Andrew Phelps McCormick TX 1832–1916 1879–1892 — — Hayes appointment to 5th Cir. 13 Robert Madden Hill TX 1928–1987 1970–1984 — — Nixon appointment to 5th Cir. 16 Patrick Higginbotham TX 1938–present 1975–1982 — — Ford appointment to 5th Cir. ^ "U.S. Department of Justice: 2002 Centennial Report, pgs. 1, 10" (PDF). Archived from the original (PDF) on 2009-06-01. Retrieved 2010-05-24. ^ U.S. District Courts of Texas, Legislative history, Federal Judicial Center. ^ Recess appointment; formally nominated on December 13, 1898, confirmed by the United States Senate on February 15, 1899, and received commission on February 15, 1899. ^ Recess appointment; formally nominated on May 23, 1919, confirmed by the United States Senate on June 24, 1919, and received commission on June 24, 1919. ^ Recess appointment; formally nominated on January 15, 1962, confirmed by the United States Senate on March 16, 1962, and received commission on March 17, 1962.